Are you dotty about running? 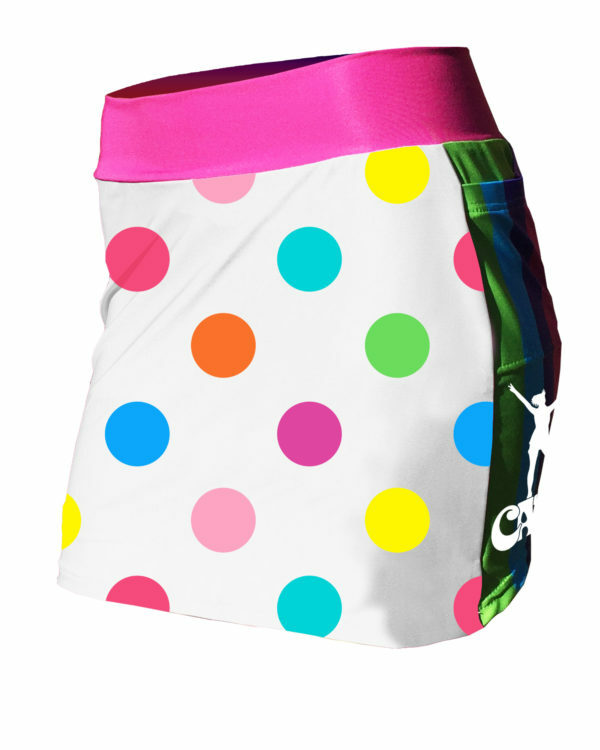 Spread a little happiness as you run, in these cute skorts designed by the queen of colour Catra Corbett. Made from our super soft technical material, our skorts have undershorts to ensure your run is as comfortable as it is stylish. Let your sportswear shine as bright as you do. All our garments are produced using sublimation print technology. Dye sublimation is the latest advance in permanent printing. The ink is embedded directly into the fabric through a process of heat and gas. This form of printing means there are no limits to the colours, blends, shadows and shapes that can be used. Sublimation printing is ideal for sportswear, as the material remains comfortable and moisture wicking. The printing cannot crack, wash off or fade, and colours remain vibrant. At Fancy Running we produce cut and sew garments. This means that the artwork is applied to each panel before sewing. Our T-shirts and vests are created from 155 MX, a soft feel, lightly textured, breathable fabric. Moisture wicking qualities ensure the garment stays drier when exercising. The lighter weight and knit of this fabric make it ideal for whatever your challenge. Our leggings are made from a premium 250 stretch performance Polyester/Spandex mix fabric with enhanced Hydrophilic properties. The spandex mix best suits a sculpted fit, giving you maximum movement . Comfort is further boosted by enhanced levels of moisture transportation and breathability. The result is a high performance piece of sportswear that feels great and looks amazing! 1 item: Royal Mail, 1st Class Signed For: £2.50. 2+ items: Signed for courier service, 2 - 5 working days: £4.50 for 2 items +50p per item thereafter. Place your order before 1pm and receive your order by 1pm the next working day (orders placed after 1pm will be dispatched on the next working day). 3 - 5 working days, tracked, signed for service. 5 - 7 working days, tracked, signed for service. Please note that overseas shipments may be subject to import duties and local tax. Please let us know within 14 days of receiving it. Once we have been informed, you must return the item, in the condition you received it, within 14 days. Customer is responsible for the cost of returning of goods to us. Please note: SALE items can only be returned for a refund - no exchanges - so please check the Size Guide CAREFULLY before ordering.